From left: Sarah Daniels, development director of the Garage; Dwayne Redd of State Farm; Michael Moyer of State Farm; Clayton Wood of State Farm; David Tideman of State Farm; Kristin Proto, executive director of the Garage; P.J. Mullin of State Farm; and Bill Rose of the Garage. Walking into the happy chaos of about 100 teens and preteens all talking at once, representatives from State Farm Insurance brought some big news to the Stone Garage in West Grove on Oct. 22. 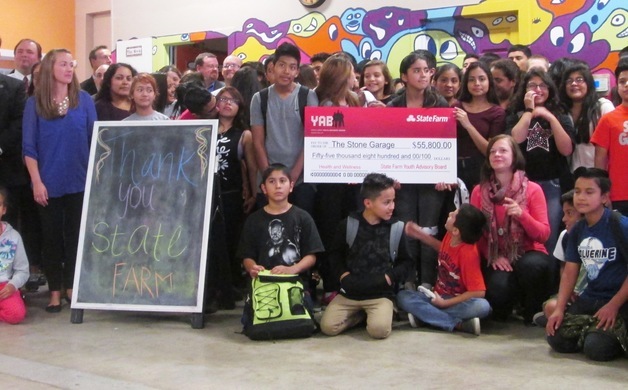 The community and youth center that's an after-school haven for hundreds of area students will be getting a $55,800 grant from State Farm to install a commercial-grade kitchen. The Kennett Garage will be getting a similar set-up. The idea is to teach young people how to shop for fresh ingredients, prepare nutritious meals, and to share those ideas with their families at home. The reward is fostering better nutrition for a low-income community that too often relies on fast food, teaching teens lifelong skills, and possibly sparking the career of a future superstar chef or two. But on Thursday afternoon, it was time for the grant announcement and a photo or two. The Garage currently has a kitchen counter, microwave and a blender, and things like chips and cookies are available. But putting in a stove will bring a whole new dimension to the lives of the teens who go there – 90 percent of whom come from impoverished backgrounds. The State Farm Youth Advisory Board is made up of 30 students, ages 17 to 20, from the United States and Canada, and they have granted more than $36 million since the board began in 2006, reaching 520 communities. Every year, they allocate $5 million in grants to projects like the Garage. State Farm public affairs specialist Dwayne Redd said it's the company's way of giving back. “It's an opportunity for us to invest back in the community and help these students understand that making healthy choices is a cool thing,” he said. Proto said now that the funding is in place, it's time to secure the equipment, line up contractors and go through all the licensing steps required. She expected the kitchen to be up and running, with a little luck, by early next year. Students at the Stone Garage in West Grove welcomed representatives from State Farm Insurance on the afternoon of Oct. 22.